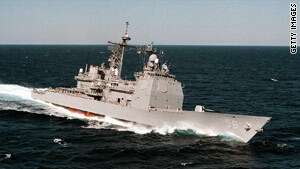 The USS San Jacinto, one of the vessels patrolling the Gulf of Aden. MME gains rare access to the coalition operation patrolling some of the most dangerous waters in the world. Ninety percent of world trade is transported by sea, and the Gulf of Aden serves as a lucrative corridor. With the lure of millions of dollars in ransom, hundreds of pirate attacks are carried out there each year. Now a new Coalition navy mission patrols the Gulf of Aden to fend off pirate attacks. Experts estimate the cost of piracy could be as high as $16 billion a year. We break down the numbers with Christian Le Miere, Research Fellow for Naval Forces and Maritime Security, IISS.